Italian veteran Luca Badoer was a surprise replacement for the injured Felipe Massa at Ferrari for the European Grand Prix in Valencia in 2009. While he retained the role of test driver dating back to 1997 with the Italian team, his call up a decade after his last grand prix start came about as the team's preferred choice - Michael Schumacher - was unable to take over the seat due to a neck injury. 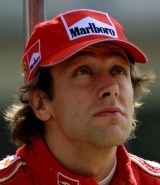 In doing so he became the oldest driver on the F1 grid but it was a short lived spell behind the wheel of the Ferrari. He rose through the karting ranks becoming Italian champion, before moving onto the Italian Formula 3 championship in which he scored his first win in 1990. His next move was F3000 where he won the championship in 1992 with Crypton Engineering with four wins from ten starts. He joined the ranks of Formula One with BMS Scuderia Italia the following year. The Lola Ferrari package was never particularly competitive yet he recorded his best position to date, seventh, in just his fourth start in San Marino. With Minardi absorbing Scuderia Italia in 1994, he moved to the new team as test driver, the following year he was promoted to a race seat which brought eighth place finishes in Canada and Hungary. Badoer moved to Forti Course in 1996, but again the equipment on offer was uncompetitive and he recorded just two finishes from six starts.